In the 15 th century the Florida Indian population was estimated to about 100,000. Florida used to be populated by Indians on most of its territory, from its northern part to its most southern tip. Throughout the centuries, act of wars, natural extinction and migratory effects resulted in only a few of them being still in Florida in the 21st century. Those Indian names were given to them by the new world explorers. When Ponce de Leon first came to Florida in 1513, he was nicely treated by Indians. The relationship between Spanish and Indian got deteriorated with the pass of the time. When European explorers landed in Florida they started to kill natives Indians. This started a wave of incidents that lasting decades to come opposing natives Indians to European invaders. Explorers imported with them their viruses that literally decimated to local population. 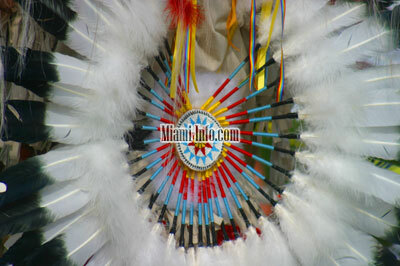 The current Indian tribes in Miami such as the Miccosukees and Seminoles live mostly in the Miami and Hollywood area. The Miccosukee are Indian americans living in the Southeast of Florida, they are "cousins" of Seminoles, but have a separate identity, they have a different language and customs. Originally they were established in Tennesse, by the 19th and 20th century started to move to Florida. Today they live in several reservation in Florida, they operate successfully casinos in Miami, and have a strong tourism industry. The total population nowatdays is around 550. They live on the Tamiami trail, just west of Miami. The Seminoles were native from Florida. The Seminole nation regrouped Indians from different areas such as Georgia, Alabama, and Mississipi. They were warriors and engaged in numerous battles against European explorers and later on US Soldiers. They fought 3 wars against the white invaders, and never surrendered. They began the 20th Century forced to hide and live in swamps in South Florida. They currently manage their own land and have a local economy based on tourism, gambling and tobacco.